There are thousands of startups launching every month by people who think that they have a great idea to share with the world and probably to disrupt the economy. And when looking at such ideas we can admit that most of them are really good, at least they sound this way. So why do we face almost the same amount of failing startups then? Well, most funders would say that their product didn’t find customers and they ran out of cash. Some could also mention team issues, product pricing and marketing problems. According to the stats, only 18% tell that problems are related to the product itself. It proves that we were right with our feelings of interesting is useful products when looking at lists of new start-ups. So, is there a way to skip or minimize these problems. When building the chart above I had an idea to separate problems that can be minimized and inevitable problems with different color. Finally, there is only one color in the chart that indicates that all problems can be forecasted, avoided or managed when you approach the project in a right way. And it is obviously clear to everyone, however, most of start-ups have lack of resources to hire good engineers, analysts, marketers, advertising professionals and so on. Funders feel that they can handle everything by themselves and once product launched and performs successfully they can afford to hire a team to move forward. Sounds like a fair approach at a first glance but let’s take a look from the other side. Working with a team of professionals costs more. Yes, if you look at pricing sheet there is a lot more to pay but the end cost will be the same for both options. How could this happen? Because as a founder you will invest all of your money into startup until you run out of cash. Based on my personal experience only this factor could stop most of the people. So the choice here is between waste or spend, look at the stats and don’t make other’s mistakes. You can’t spend more than you have but working with experienced professionals will help to validate the idea, plan project’s budget and properly execute it. 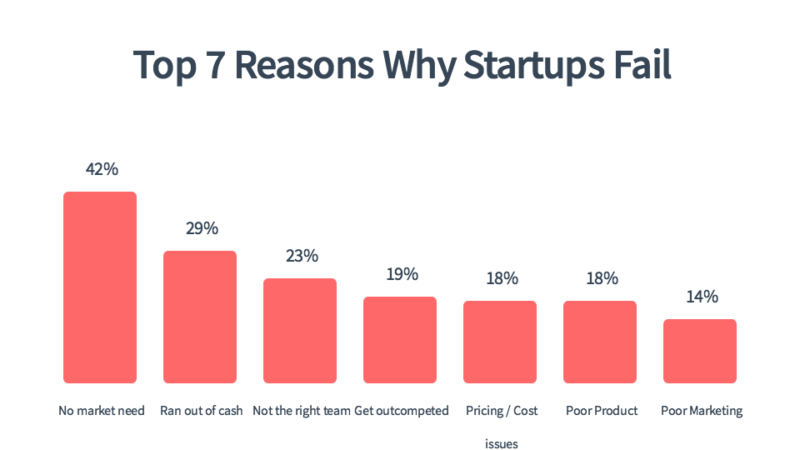 Of course, this blog post doesn’t cover all cases but it should make you think before planning a startup and find the right approach. Feel free to reach us if you need an advice on your project, we would be happy to help!